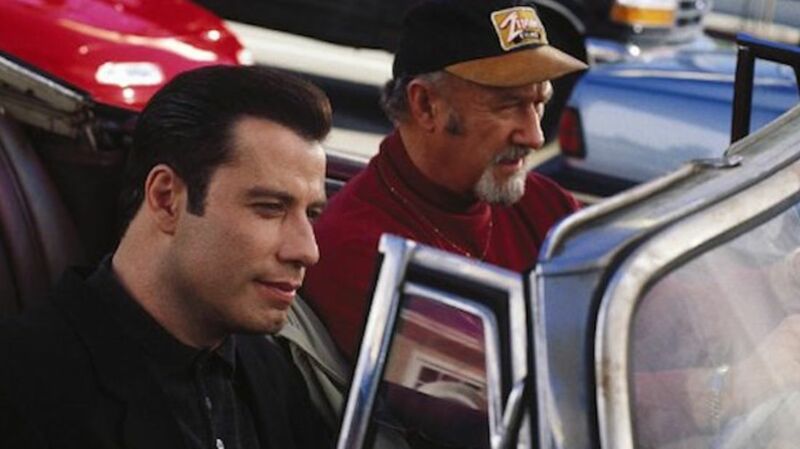 The first Elmore Leonard adaptation widely considered to be as good as the book, Get Shorty continued John Travolta’s return to box office prominence. Travolta played Chili Palmer, a Miami loan shark (and cinephile) who travels to Los Angeles to collect a debt from a schlocky B-movie producer (Gene Hackman), then decides to stay and make his Hollywood dreams come true. To celebrate the film's 20th anniversary, here are 15 things you might not know about Get Shorty. 1. "SHORTY" WAS DUSTIN HOFFMAN. Danny DeVito’s Martin Weir character was modeled after Dustin Hoffman, who Elmore Leonard dealt with when the actor expressed interest in an adaptation of the author’s LaBrava. Weir's very specific food order at a restaurant was based on Hoffman ordering off-menu at a lunch meeting with Leonard. Hoffman suspected he was Shorty after the book came out. 2. DANNY DEVITO WAS ORIGINALLY SUPPOSED TO PLAY CHILI PALMER. Scheduling conflicts got in the way of Danny DeVito playing Chili Palmer. Fittingly, director Barry Sonnenfeld met with Dustin Hoffman to play the part, but he wouldn’t commit. Michael Keaton turned down the chance to play the loan shark, too. When Sonnenfeld talked to Warren Beatty about the part, Beatty asked the director, "Why would a guy as good-looking as me be such a low-level Shylock?" 3. QUENTIN TARANTINO CONVINCED TRAVOLTA TO PLAY PALMER. Travolta said no to Sonnenfeld. Twice. His Pulp Fiction director convinced him to change his mind. 4. SONNENFELD WANTED SAMUEL L. JACKSON TO PLAY BO CATLETT. Delroy Lindo got the part instead. It was his first major studio film that didn’t involve Spike Lee. 5. GENE HACKMAN DIDN’T THINK HE COULD BE FUNNY. Gene Hackman was reluctant to take on the part of Harry Zimm, insisting to Sonnenfeld that he didn’t do comedies, and feared embarrassing himself as someone trying to be funny. Once it was explained to him that all of the actors would be playing the material straight—that they would take themselves and what they said seriously—Hackman was on board. 6. MATTHEW MCCONAUGHEY AND STEVE BUSCEMI WERE CONSIDERED FOR RONNIE WINGATE. Jon Gries, best known as Uncle Rico in Napoleon Dynamite, got the part after the filmmakers saw about 250 other actors. 7. DENNIS FARINA’S FAVORITE CHARACTER IN THE BOOK WAS THE CHARACTER HE PLAYED IN THE MOVIE. As a fan of Elmore Leonard's work, Dennis Farina had read Get Shorty and thought how much he'd love to play Ray "Bones" Barboni if it was ever adapted into a movie. "I thought he was the most honest guy in the whole story," Farina told The A.V. Club. "He wanted his money, and that was it. There was no pretense. He wasn’t trying to make a movie. He wasn’t trying to be anything else. He was a gangster who wanted his money." 8. THE SCREENWRITER KEPT SENDING HIS DRAFTS TO LEONARD. "I really tried to preserve the dialogue, which is what he most cares about," screenwriter Scott Frank told The New York Times. "Dialogue had to be cut, but I never paraphrased. I was careful not to mess with that dialogue." Frank also got rid of one subplot and ended the movie two-thirds into the book. Frank believed the problem with previous unsuccessful Leonard adaptations was too much of an adherence to the heavy plots. 9. TRAVOLTA MADE SURE LEONARD’S ORIGINAL DIALOGUE WAS IN THE SCRIPT. 10. THE REAL CHILI PALMER WAS IN IT. Semi-retired P.I. Ernest “Chili” Palmer portrayed one of Ray Bones’ thugs. Leonard and Palmer got to know each other over the years when Leonard kept going back to him for research. One day, Leonard sought Palmer's permission to use his name as the protagonist in one of his books. 11. BEN STILLER WAS CUT FROM THE FILM. 12. BARRY SONNENFELD MADE A CAMEO. The director cast himself as the Las Vegas "beefeater" hotel doorman. The hotel was actually the Hyatt Regency Century Plaza in Century City, California. 13. HARVEY KEITEL MADE AN UNCREDITED CAMEO AS A FAVOR TO DANNY DEVITO. He claimed his (credited) role as a manager in the film's sequel, Be Cool, was purely coincidental. 14. SONNENFELD KEPT INSISTING FOR LINES TO BE SPOKEN FASTER. The director insisted on it because of all of the dialogue they had to get through. 15. ELMORE LEONARD LOVED IT. "Definitely, it's the best adaptation I've had," Leonard said at the time of its release. At that point, 12 of his books had been adapted into movies. He also said he never realized how funny Get Shorty was until he saw the film.